Premium materials, an outstanding driving experience and incredible craftsmanship are jus a few of the things that make the new Wranglers stand out. Come down and explore your options at our dealership and take home an incredible new car with the latest technology and features available. This vehicle has the iconic look you’ve come to expect and plenty of features to keep you entertained on the road. Why LEASE 2018 Jeep Wrangler models from our dealership? Our dealership has great deals and the latest 2018 Jeep Wrangler models available at our dealership serving Thornton Colorado shoppers. Why LEASE 2018 Jeep Wrangler models from our dealership? When you drive home a new Wrangler, you’ll be able to choose your next destination with the confidence that your vehicle will have the capability and durability to get you there safely. Come down and explore the iconic features, including the rounded headlamps, fold-down windshield, flat fender flares and distinctive seven-slot grille. You can also customize the exterior thanks to the removable top and doors. This vehicle is capable of expanding and adjusting to meet the needs of each of your expeditions. You’ll have an amazing array of options that make this vehicle one of the most expansive and adjustable off-road vehicles on the market. Come down and explore your options at our dealership, and we will be able to provide you with an expansive list of features and amenities. 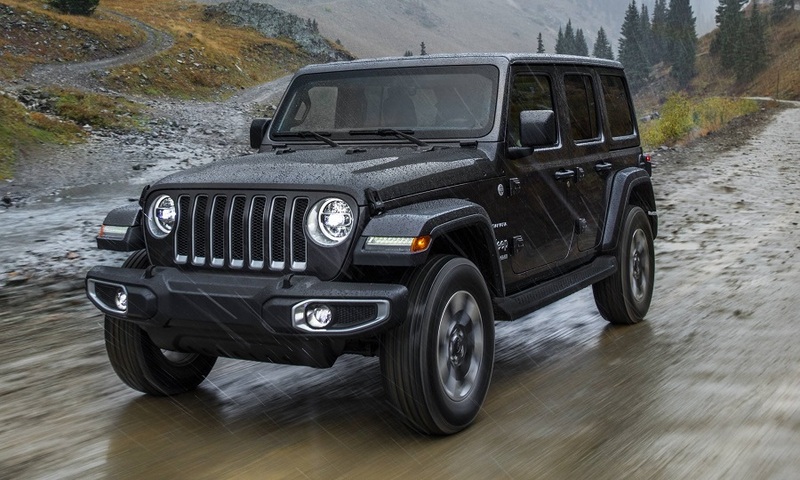 Explore our 2018 Jeep Wrangler models available at our dealership serving Thornton Colorado shoppers and find out about all of your exterior options. The latest technology and materials that are designed to get you in the driver’s seat with full control of your surroundings. From the intuitive placed controls on the steering wheel and smart touchscreen to the voice-activated commands that allow you to get more accomplished while keeping your eyes focused on the road, the new Wranglers feature all of the technology you need to get work done on the road. The interior of the cabin is designed to provide you with wide open spaces on the inside so that you can get out and enjoy nature. With three trims to choose from, you’ll love the ability to customize your interior options and enjoy an enhanced driving experience. Get your lease near Thornton and contact Pollard Jeep to find out how you can get a Jeep lease. Apple CarPlay, UConnect systems and Android Auto are just a few of the options waiting for you. The new Wranglers are more capable than ever before. Come down and explore the trail-rated features that are designed to help you get the most from your driving experience. This vehicle is designed to provide you with an outstanding level of reliability and service. You’ll get incredible traction, articulation and ground clearance to handle the most intense terrains. The vehicle offers tremendous traction control, and it effectively transfers power to the ground to give you the maximum efficiency. There are also 4×4 systems, and water-fording capabilities to help you navigate the most intense terrain. Switch easily from 2WD to 4WD when the conditions warrant a change in gears. Get your lease near Thornton and contact Pollard Jeep for additional information and incentives on your next Jeep lease. With two engine options to choose from, you’ll have a vehicle with the right amount of power for your situation. Why LEASE 2018 Jeep Wrangler models from our dealership? Start with the base-line 2-liter turbo engine that provides you with 270 horsepower and 295 pound-feet of torque. You can also upgrade to the 3.6-liter Pentastar V6 engine with 285 horsepower and 260 pound-feet of torque. No matter what engine you decide to go with, this vehicle is designed to provide you with an exceptional level of capability. Come down and explore all of your options at our dealership so that you can get the best possible driving experience. We have the latest 2018 Jeep Wrangler models available at our dealership serving Thornton Colorado shoppers. Both passive and active safety features combine to provide you with a vehicle that is capable of helping you get where you’re going with ease. This vehicle is designed to give you outstanding options, including an advanced front and side airbag system and high-strength steel beams that are designed to improve side-impact resistance to collisions. The vehicle also has a stiff frame and will keep you protected all the way around. Come down and talk with us about some of the new features, including blind spot monitoring, rear cross path detection and other radar-based systems that are designed to keep you safer than ever before. Get your lease near Thornton and contact Pollard Jeep for additional information and incentives on your next Jeep lease. Give our dealership a call, stop by or check out your options online. We will work with you to help you get an incredible deal on your next vehicle, but you have to trust us to help you get the latest deals and incentives on your next purchase. Our staff will help you select the vehicle that’s perfect for your situation so that you can drive away in an incredible new vehicle. Come down and talk with us today and drive away in an incredible new vehicle.